Close to 100 drivers will do battle on track at Croft Circuit this coming weekend (28-29 May) when no fewer than 18 races take place as part of a non-stop programme of action for saloons, single-seaters and sportscars. 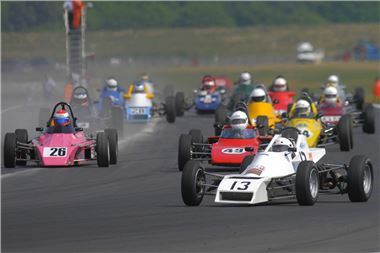 The North East’s premier motor sport venue just outside Darlington will be hosting a National Championship fixture for the famed British Automobile Racing Club, featuring two hotly contested races each for BMWs, Legends (stock cars), open-topped Clubmans (sportscars) and both classic Formula Ford 1600 and Formula Ford 2000 single-seaters. Both FFord grids will surely bring back some great memories for enthusiasts as they include the type of car raced by many drivers who later went on to star in Formula 1 in the Seventies and Eighties. Furthermore, there will be a number of drivers from across the Croft region targeting strong results at what is a home circuit for them. York’s Mike Cutts, a front-runner in the Darlington & District Motor Club’s Northern Saloons & Sportscars series, will be looking for glory in the BMWs. Middlesborough’s Daniel Gibson and Sheffield pair Chris Hart and Peter Harper are all entered for the Clubmans category. Leeds’s Peter Chippindale plus James Buckton (Harrogate) and Paul Walton (Bingley) contest the FF2000s and FF1600s respectively while York’s Dominic Spurr takes on the Legends field. The on-track action on Saturday starts with qualifying at 9.30am followed by ten races starting from midday. Sunday also starts with additional qualifying, again at midday followed by eight more races from 1.30pm. Admission for adults is just £12 per day (payable on the gate) with entry for children aged 15 and under FREE. Car parking is also free and all admission includes access to the race paddock enabling the public to get a close-up look at the cars as they are being worked on as well as a chat with many of the competing drivers over the weekend. Croft Circuit Manager Tracey Morley commented: “This is an excellent club-level race event for fans of four-wheeled motor sport to come and enjoy and those attending will undoubtedly view this weekend as something of a warm-up for our big forthcoming Dunlop MSA British Touring Car Championship fixture in just over three weeks’ time (18-19 June). Indeed, our main circuit office will be open throughout this weekend for those yet to purchase their BTCC tickets at the special advance rate. For more information about Croft Circuit plus details on ticket prices/how to book as well as the chance to drive a variety of supercars (including a Ferrari 458) visit the www.croftcircuit.co.uk website or call the circuit office on 01325 721815.